Recently my second collection of poetry and short stories, Wake, was re-released in second edition. And next month – June 2015 – my Kindle shorts, Four Season Summer and Season’s End, are being released in a combined paperback edition. More info. and links to buy will appear here, in due course. P.S. Did you know you can get news about my books and other writings straight to your inbox? My next newsletter is going out in just a couple of days, and you can sign up here. It’s completely free and typically goes out every three to four months. It’s been quite a while since I burst into tears for no apparent reason, but tonight I did. Sometimes that’s what depression is like – it hits you out of nowhere. And sometimes it’s just this thing in the background that is on your radar, but no one else has any awareness of it in your life. Depending on how it affects you (and it does affect people differently) it can really get in the way of ‘normal life’. It can be hard to hold down a job, for example, when things are really bad. I’m lucky that I work for myself and can arrange my own schedule, to compensate for and work around those days where I’m just not up to it. Writing in itself usually helps me feel better, but some days it doesn’t work and I can’t compose a coherent tweet let alone work on anything more substantial. I wanted to write a post for mental health week, but this isn’t the one I imagined. I guess I wanted to be more factual. To come across more professional. But that’s just the thing, isn’t it? My writing is an extension of who I am. And today who I am is a little bit of a mess. Not everything has to be perfect, I remind myself. In fact, some things are probably better being raw. So this is it: my personal experience of being a full time writer with mental health issues. It’s not profound, or polished, but it’s here. I encourage you to tell your story, also. No matter what it looks like. I watched a TED talk once (I love TED talks!) in which some scientist or doctor or something said that people most likely to reach their goals A. actually outline their goals (rather than keep them as vague ideas just in their heads) and B. don’t necessarily have more self control than those people who fail but, rather, put things in place to take them out of the path of temptation, so they don’t need to fight themselves in the first place. Well, I like setting myself goals, and I’m not particularly good at sticking to them, but this new thinking resonated with me. As such, I have a new ploy to stop myself from getting distracted on the internet when I should be writing, which is (drumroll please! ): disconnecting the internet before I go to bed. Genius, right? Okay, well, to some people that may sound daft, or obvious, and certainly not worthy of a blog post, but hear me out. Turning off the Internet before bed means that you’ve already got a good chance of success before you even begin your day. Going offline is so much harder half way through the day, when you’re already lost in a sea of cat GIFs on Tumblr. 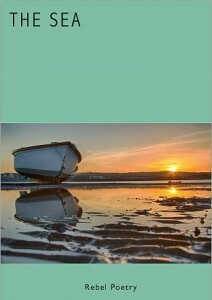 A poem of mine has just been published in an anthology, titled The Sea (pictured). The book is published by Rebel Poetry, has over fifty contributors, sports some lovely full color photographs, and has all proceeds going to the Royal National Lifeboat Institution (RNLI). Although the official launch was last week at Ardgillan Castle, I’m told there are to be two more: one at the headquarters for Dublin Port Company (the book’s official sponsor), and one in Cork. I’m hoping to make it down to one of these, but I won’t know which until official dates are confirmed. Updates are going up on the official Facebook page every other day or so, so you can keep an eye there for more info.